The Queen’s Gallery presents the first exhibition of Roger Fenton’s Crimean works in London since 1856, the exhibition entitled Shadows of War: Roger Fenton’s Photographs of the Crimea, 1855 explores how the photographer brought the stark realities of the Crimea war to the public through more than 60 photographs from the Royal Collection. 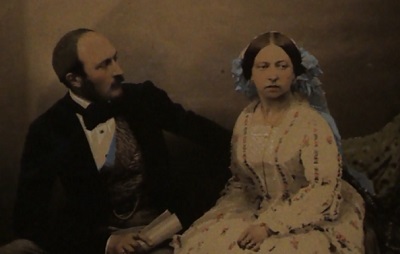 Roger Fenton was already a respected photographer (Queen Victoria had commissioned Fenton to produce portraits of the royal family in 1854) when he travelled to the Crimea. 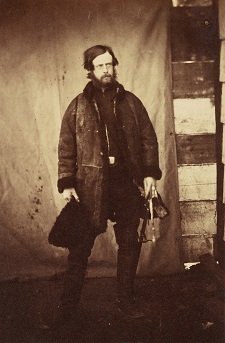 He had been commissioned by the publishers Thomas Agnew & Sons to photograph people of interest in the Crimea for use as source material for a painting by the artist Thomas Barker. 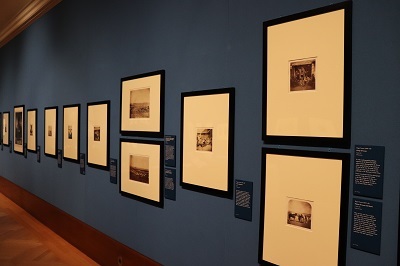 However, Fenton’s photographs of bleak terrains and exhausted soldiers would have a profound impact and marks one of earliest examples of war photography. 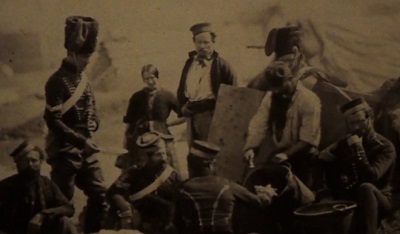 When Roger Fenton arrived in the Crimea in March 1855, the war had been fought for 12 months and many of the major battles of the campaign had already been fought. Fenton spent three months producing approximately 360 photographs, travelling and working in a mobile darkroom that he had converted from a wine merchant’s van. To a public that had been given selected information about the ‘great’ campaign and the famous Charge of the Light Brigade, Fenton’s photographs were a stark reminder of the horrors of war. 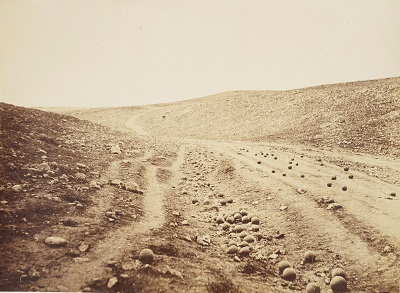 In his most famous photograph, Valley of the Shadow of Death (23 April 1855), he places the viewer at the bottom of a barren ravine littered with cannonballs leaving it to the viewer’s imagination to create a picture of past events. Britain sent 98,000 men into the conflict and Fenton spent several weeks photographing the key figures of the war. One of his best-known portraits, The Council of War (June 1855), shows the three commanders of the allied armies – Lord Raglan, Maréchal Pélissier and Omar Pasha preparing for an assault on the Russian fortifications. An exhausted looking Lord Raglan died shortly after the image was taken. 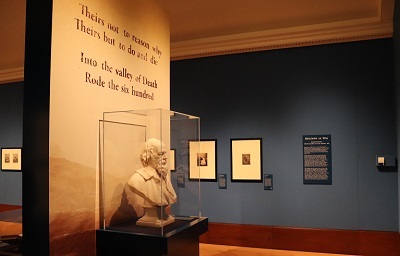 One of Fenton’s more haunting images in the exhibition is Lord Balgonie (1855), who seems to be suffering from some kind of psychological problem associated with the conflict. The majority of Fenton’s portraits depicted senior officers, however he did photographs troops on the frontline usually around the cooking facilities or showing the after effects of battle. 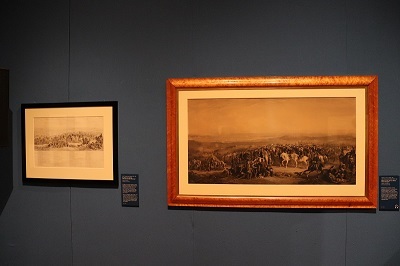 Although Fenton did not produce scenes of battle and death, he photographs were a stark contrast to artistic depictions of battle which tended to glorify the conflict. Fenton returned to Britain in July 1855, and in September his Crimean photographs went on display at the Water Colour Society on Pall Mall. 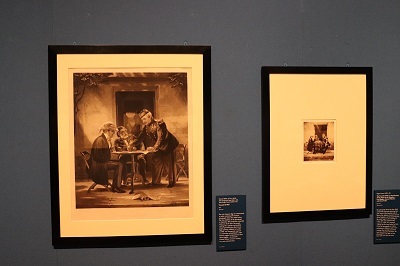 The images raised awareness of the conditions endured by soldiers and Queen Victoria took a personal interest in the conflict and the welfare of the troops. 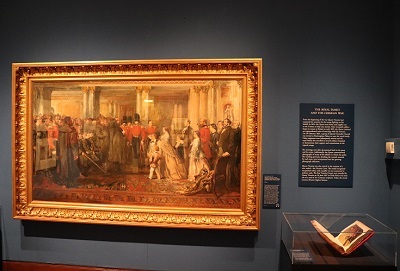 The exhibition features a 1856 painting by John Gilbert which shows Queen Victoria meeting wounded soldiers in Buckingham Palace in 1855. This interest was translated into practical action when she became the first British monarch to meet and support wounded soldiers in public, personally greeting troops at Buckingham Palace and during visits to hospitals. She also instituted the Victoria Cross, which remains the highest award for gallantry in the British Armed Forces. 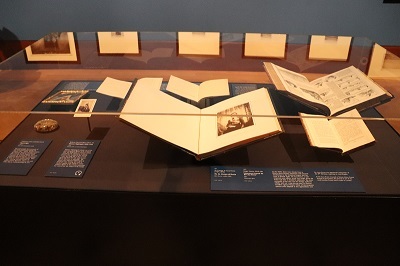 This thought-provoking exhibition provides some insights into how the advent of photography changed many of preconceptions of how war was presented to the public. Fenton’s photographic technical and practical skill created a body of work which amazes the modern viewer. It is important to remember that photography was still in its earliest development when Fenton travels to the Crimea and yet he produces portraits of considerable psychological depth and landscapes that live long in the memory. 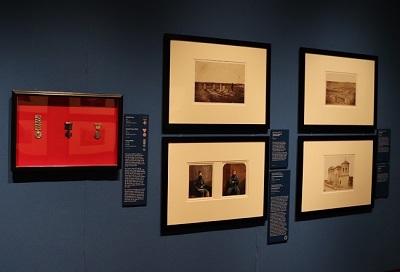 Shadows of War: Roger Fenton’s Photographs of the Crimea, 1855 is at The Queen’s Gallery, Buckingham Palace, 9 November 2018 – 28 April 2019, with Russia: Royalty & the Romanovs. By londonvisitors2014 in Exhibitions on November 8, 2018 .